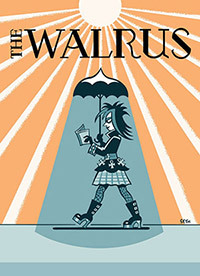 It seems Seth drew the July/August 2010 covers (I’ll admit I didn’t know that, my Walrus subscription started with September 2010), and they are quite lovely, very stylized and very Seth. The magazine interviews Seth about the minutiae of creation (type of pens and paper), it’s a snapshot at the process of creation by a cartooning star. Charles Schulz would be the first — beginning in early childhood. Later in my teens it would be Jack Kirby. In my early twenties I discovered Robert Crumb and the Hernandez brothers — huge influences that utterly changed my thinking about comics. Then comes Herge (Tintin) and the artists of the old New Yorker (Arno, Addams, Hokinson, Steig, etc.). Lynda Barry fits in here somewhere, and later on my best friend Chester Brown had a tremendous effect on my work and my thinking. 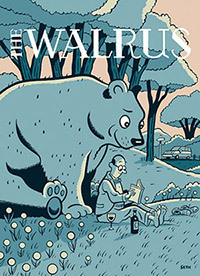 In the last ten years I have been deeply effected by the work of Ben Katchor and Chris Ware. Both of them greatly inspirational in making me think about how to tell a comic story. Of course, a list like this leaves out the rich veins of influence and interest that come from every field of the arts — Alice Munro, Glenn Gould, Thoreau MacDonald , Norman McLaren, Henry Darger, Edward Hopper, Stanley Spencer, Ozu, Tanizaki, Kawabata, Mike Leigh, Nabakov… I’m just rattling these names off the top of my head but I could go on and on. Everyone of those names has had a profound effect on my thinking. Soon to be released is Palookaville 20. (See a PDF preview at the D+Q site.) 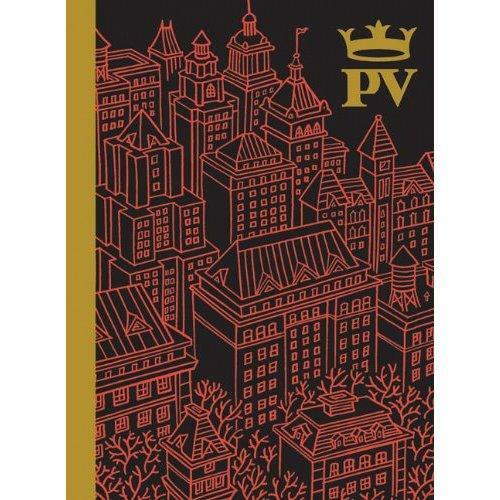 An extended hardback version of his Palookaville series which contains a continuation of Clyde Fans, a autobio comic about “his awkward struggle to overcome isolation and communicate with the people around him”, and an essay on why he needed to build a mini fictional city. Palookaville 20 will be available in better comic shops across Canada. This entry was posted in 2010 Releases, Newspaper articles by Robert Haines. Bookmark the permalink.